On the other hand, with most of the major names already reporting last quarter’s results, where we are is close to where we’ll be when the earnings season dust settles. And as it stands right now, last quarter’s earnings growth for the S&P 500 was solid not because of technology stocks, but despite them. Blame Apple (AAPL), mostly. The company makes up roughly 3% of the S&P 500’s total value, and even more in terms of net earnings. Its fiscal first quarter earnings may have reached a record-breaking $4.18 per share, but that growth was the result of stock buybacks. Total net income actually fell year-over-year — even if only slightly — after a long period of reliable growth. Other major names certainly acted as a drag too, however, with many of the sector’s constituents relying on a healthy Apple. The S&P 500 Technology Sector Index is on pace to earn $17.54 per share for the last quarter of last year, up a mere 1.5% from the final quarter of 2017’s bottom line. Operating margins fell, as did the amount of total revenue driven for the S&P 500 by the technology sector alone. A year ago, it chipped in nearly 13% of the S&P 500’s total revenue. Last quarter, that figure was a tad below 11%. The winners? Amazingly enough, healthcare and financials. The former’s fourth quarter bottom lines are up an average of just under 20% year-over-year, while the latter’s so far sporting a 26% improvement. Higher interest rates have helped banks. All told, for perspective, the S&P 500 is now expected to earn $38.99 per share for Q4, up 15% from Q4 2017. But, that growth won’t be led by its most familiar tech names. It’s not the end of the world. Indeed, it was the technology sector’s outsized sales and earnings from a year ago – and a couple of quarters before and after – that was extraordinary, and unusual. In the midst of smartphone mania, the race to 5G, a shift toward subscription-based business models and the heart of cryptocurrency mania all materialized at the same time other industries were hitting a pre-tax-cut wall. More than anything else, last quarter’s technology revenue and earnings lull is a return to the norm. Technology’s net-earnings contribution to the S&P 500’s bottom line deteriorated in a big way in the fourth quarter. It’s still the biggest contributor, but the financial sector and then the healthcare sector are actually earning their way into making a more significant impact than they had just a year earlier. Looking ahead, the all-important tech sector is expected to see earnings growth this year after a lackluster 2018, but there’s no clear picture as to how or why that growth may take shape. That’s in contrast to the healthcare and financial sectors, both of which are expected to see earnings growth this year by merely extending last year’s pace of progress. For investors, the implication is simple enough: The market’s primary pace-setting sector – technology — is waning in importance to the overall bottom line. It’s conceivable that even if all other sectors drive marketwide profit growth, it could feel as if the broad market is doing poorly… particularly if tech stocks fail to live up to relatively lofty earnings expectations. Perception can be powerful. 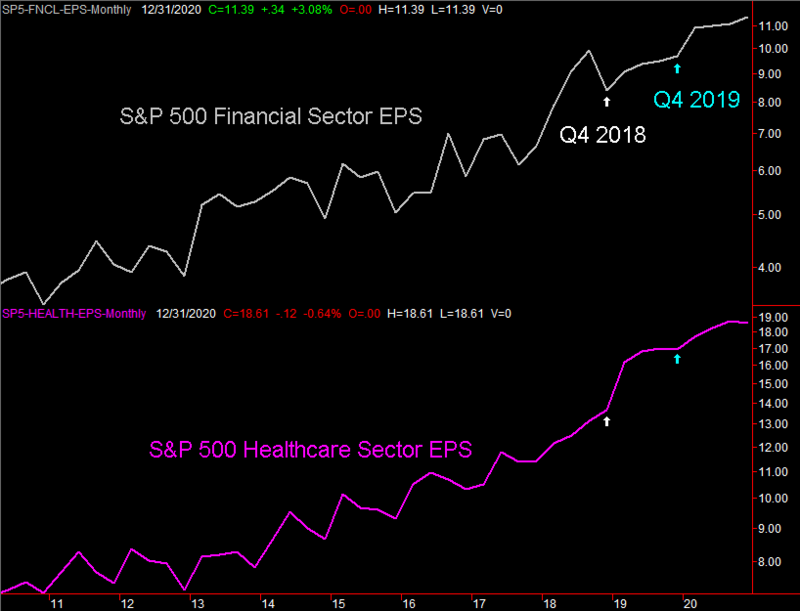 At the same time, for the few investors that drill down into the details, the ‘pulse’ of the market’s overall earnings tide will increasingly lean on healthcare and financial stocks. Fortunately, both are already on a steady growth track. It’s a shift that will require investors to navigate the market’s waters very carefully, which isn’t atypical in the latter stages of a bull cycle.